Don't worry about not tweeting the setlist - just as long as you post it here! Sorry, that's not my thing, VG ! I will try to post the (IMHO) highlights though! A preview of tonight's show in San Diego , including photos from a show there in May 1978. 'Here are some photos taken by Jon Foster from 1978 at the civic center. What great photos from 1978 - a real treasure, thanks ! Setlist.fm has a setlist. I don't know how accurate it is. "Another Brick In The Wall" was just a few lines, according to Suzanne on Facebook. 24. Jimmie Standing in the Rain / Brother, Can You Spare A Dime? verbal gymnastics wrote: Mexican Divorce? And No Coffee Table wrote: Setlist.fm has a setlist. I don't know how accurate it is. It's gone through a number of revisions over the last hour or so. On Twitter, @ecsongbysong (and Joyce Millman) has some setlist detail. @joycemillman wrote: Wait ... what? Pink Floyd? @ecsongbysong wrote: I thought I dreamed it, but it was for real. Just one iteration through the verse and chorus, but uh... yeah. @joycemillman wrote: Ooh! I figured it out! Was played in or near Mexican Divorce, right? It's a ref to Trump's wall on the border. And I think Another brick in the wall was another political reference. Elvis Costello was in San Diego last night at the Balboa Theatre, and a few lucky FM 94/9 listeners and I had the chance to see him. For me, it was the first time, and often, weighed down by a lifetime of expectation, shows like this can turn out a little under whelming. Elvis Presley might be 'The King' but Costello held court in San Diego last night. From the moment he walked on stage, alone, in almost total darkness to perform Complicated Shadows, he grabbed ahold of the sold out crowd, and never let go. Through an almost 3 hour, 30 song set that included two encores, 85% of which just featured Elvis sans backing band or other musicians, he commanded the room in a way I've rarely experienced. In our millisecond attention span culture, where flash, pomp, and circumstance is usually the champion of the day, having a musician of Costello's caliber, with a catalog spanning parts of 5 decades, simply walk on stage, share his stories and his music in such a personal way, and have a silent room hanging on his every word and note was incredibly refreshing. He hit some fan favorites including Accidents Will Happen, Watching the Detectives, Beyond Belief, and during his first encore, Alison and Pump It Up, but the evening was full of unexpected treats and surprises. Ping ponging back and forth from a choir of acoustic and electric guitars behind him and the grand piano, he covered Los Lobos (A Matter of Time) Grateful Dead (It Must Have Been The Roses) Pink Floyd (Another Brick In The Wall Part 2) The Davis Sisters (I Can't Stand Up For Falling Down) Cliff Edwards (Side by Side) as well as an amazing, seemingly off the cuff tribute to the recently departed Merle Haggard (The Bottle Let Me Down). A friend who was working at the venue told me that Costello's people had warned them ahead of time "He's been going a little bit long lately," which they took to mean 20 or 25 minutes, but when the dust settled, Costello had performed for nearly an extra hour, and not only lived up to all my expectations, but surpassed them all in glorious fashion. In a world of managed expectations, auto tune, and backup dancers, it was a reassuring experience to see that music is still alive and well. Long live THE KING. 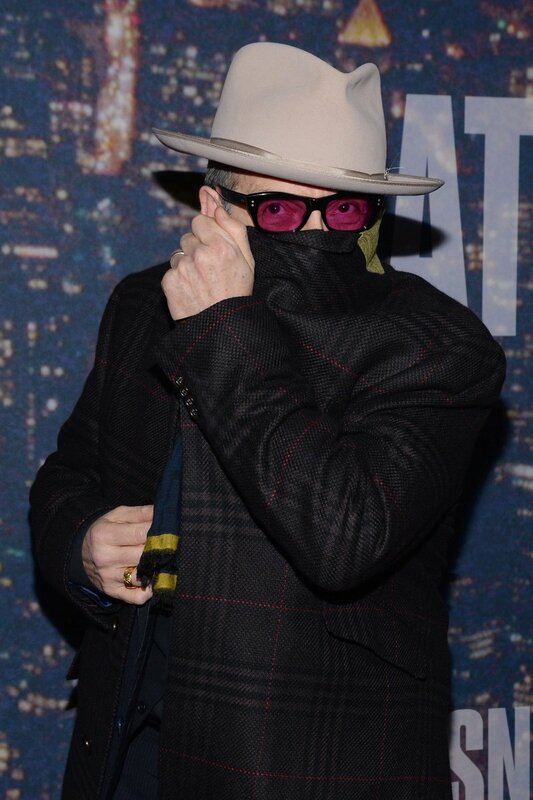 The first half featured around 20 songs, beginning with “Uncomplicated” and concluding with “Watching the Detectives.” The latter number was one of several in which Costello, 61, electronically looped his rhythm guitar part so he could play a distorted, bare-bones lead on top of it. "The sold-out show’s opening portion lagged because of Costello’s often painfully strained voice, bumpy pacing and an over-amplified sound mix — how hard can it be to get a good balance with just one vocal microphone and guitar?"